Elementary School Garden: New Mom, New Workspace! I love being a new mom. The cuddles, smiles, and experiencing something new each day. However, being a mom is time consuming. When is there time to fit in blogging, creating, and prepping to teach again soon? 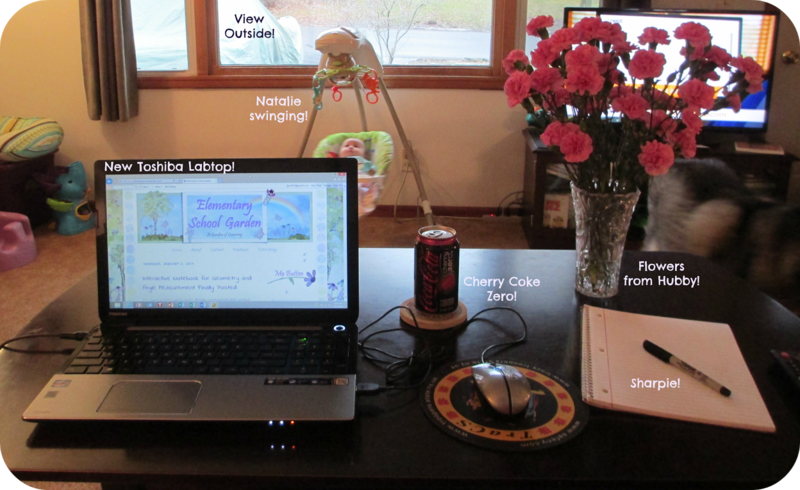 I have a cute office set up in one of the spare rooms of our house. However, I can't see Natalie when I'm hiding in the room. And she is fussy, very fussy. (Hmmm...I wonder where she gets that from.) She either wants to be held, in her swing or rocked in her rock n' play. So, I've moved part of my office to the family room. 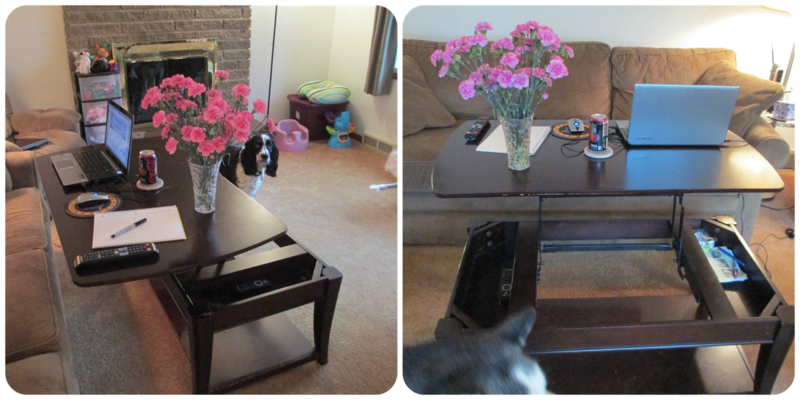 We have an amazing coffee table that lifts up to a full table height. It has little storage slots underneath where I can hide pens and notebooks away from my dogs. (Yes, they still try to steal...and eat my nice stuff). Now, I can keep an eye on sweet baby Natalie while I catch up with all of my blogging buddies. How does your home office look? Any tips for a new mom? That's a perfect setup! You are one lucky lady! Congrats on your new baby. It's just too bad that they grow up so fast! Those tables are awesome!! I used to have in my old apartment :). Your hubby is so sweet to bring you flowers. Congratulations on being a new mommy!! Congratulations! Seems like a very practical set-up to me. Our current house doesn't have a designated office, but the new one will :) My laptop sits on an end table in our living room so I can work while the little one plays.